The waxing crescent Moon shines amid the stars of the Hyades cluster. I shot these on the evening of March 24 when, from western North America, the Moon appeared superimposed in front of the sprawling Hyades star cluster in Taurus. The main image at top is with a 200mm telephoto lens and takes in most of the Hyades and the bright red star Aldebaran at lower left. Unfortunately, it also includes a blue lens flare from the brilliant and overexposed crescent, a tough element to “photoshop” out. The image is a high dynamic range stack of 3 exposures. 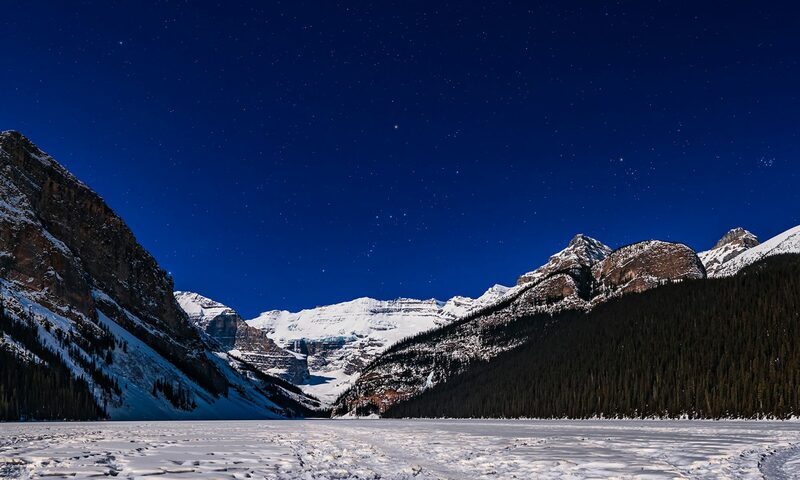 Even so, I purposely overexposed the Moon to bring out the stars and their colours. 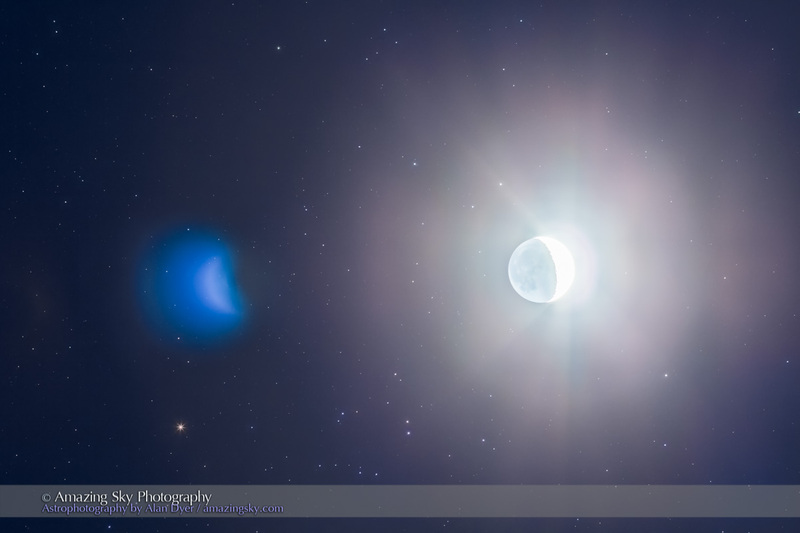 This close up of the Moon includes fewer Hyades stars, but with the Moon centred I was able to avoid the lens flare. It’s an HDR stack of 5 exposures, to capture details in the sunlit crescent as well as on the dark side of the Moon lit by blue Earthshine. These are the last telescopic shots from my winter in New Mexico, as the telescope and mount gets packed up tomorrow, in preparation for the trip back to Canada. It’s been a fabulous winter of sky shooting, with some 500 gigabytes of images shot, processed, and archived! This weekend and early next week look for the Moon passing planets and star clusters in the evening sky. 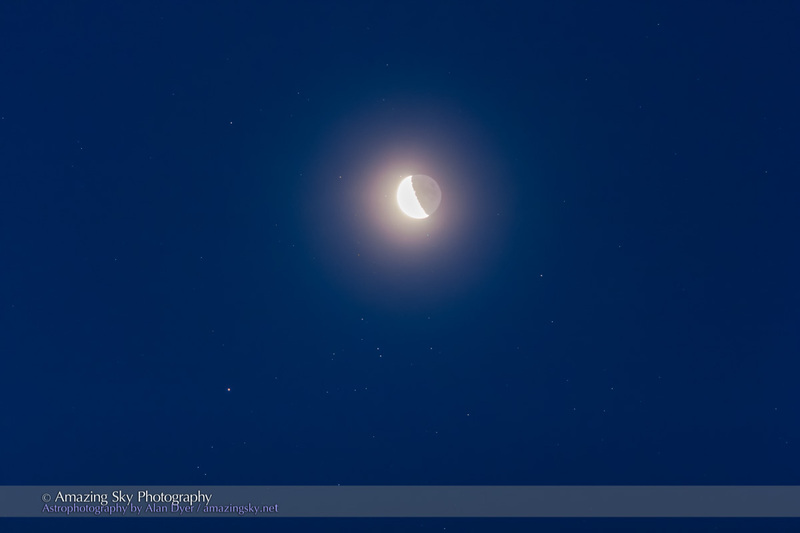 The waxing Moon returns to the evening sky on Saturday night, March 21, a day and half after it eclipsed the Sun over the North Atlantic and Europe. 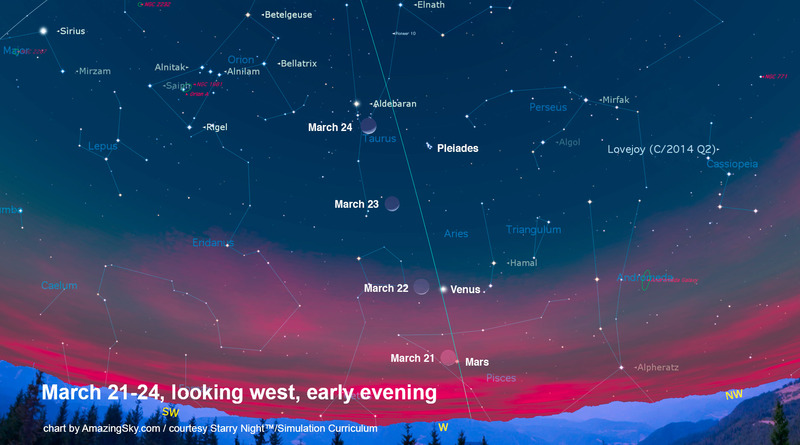 On Saturday, March 21 look for the thin crescent Moon very low in the west sitting just a degree (two Moon diameters) left of reddish and dim Mars. The next night, Sunday, March 22, the Moon, now a wider crescent, shines three degrees (half a binocular field) left of brilliant Venus, for a beautiful close conjunction of the night sky’s two brightest objects. The photo ops abound! This is one of the best Moon-Venus meet-ups of the current “evening star” apparition of Venus this winter and spring. Next month, for example, the Moon will sit six degrees away from Venus on April 21. On Monday, March 23, the crescent Moon sits between Venus and its next destination, the bright star Aldebaran. 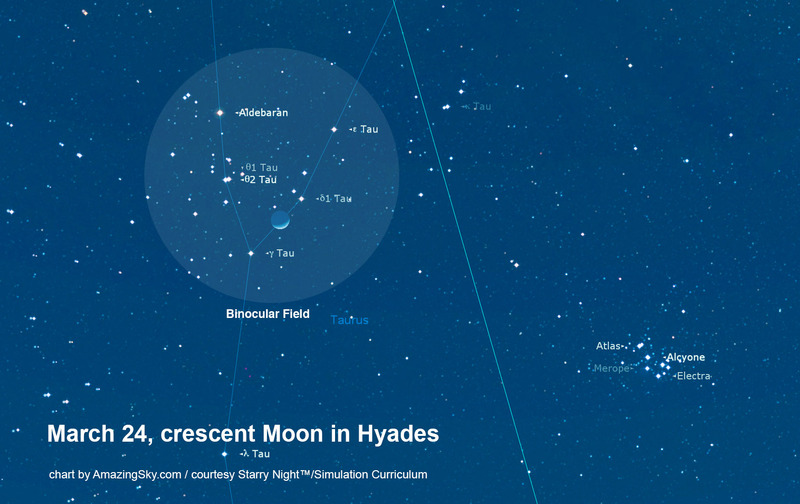 On Tuesday, March 24, the Moon, still a crescent, shines amid the stars of the Hyades star cluster near Aldebaran in Taurus, for a wonderful binocular scene. 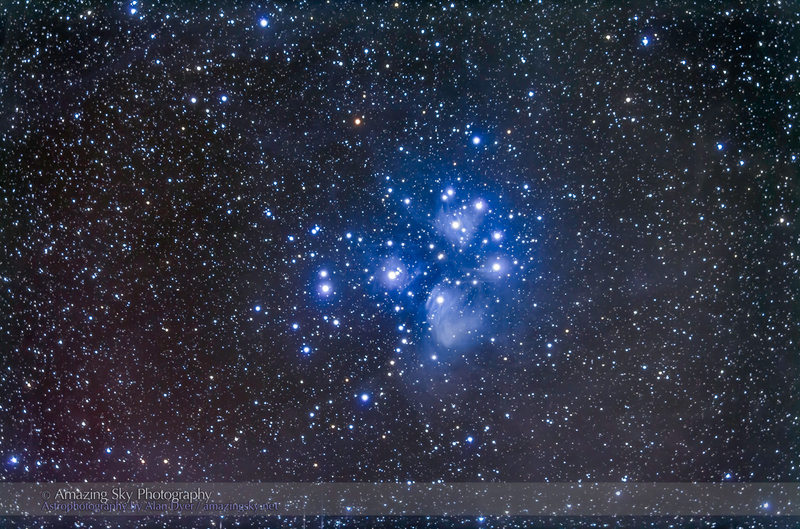 The more famous Pleiades star cluster is near by. On all nights, you’ll see the night side of the Moon dimly illuminated by Earthshine, sunlight reflecting off the Earth and lighting up the dark side of the Moon. Here’s a close-up of the March 24 scene, with the Moon in the V-shaped face of Taurus the bull that is marked by the widely scattered Hyades star cluster. Please note: This diagram and the main chart above, are for western North America. From eastern North America, the Moon will be 2 to 4 Moon diameters lower in the sky for each of the dates indicated. 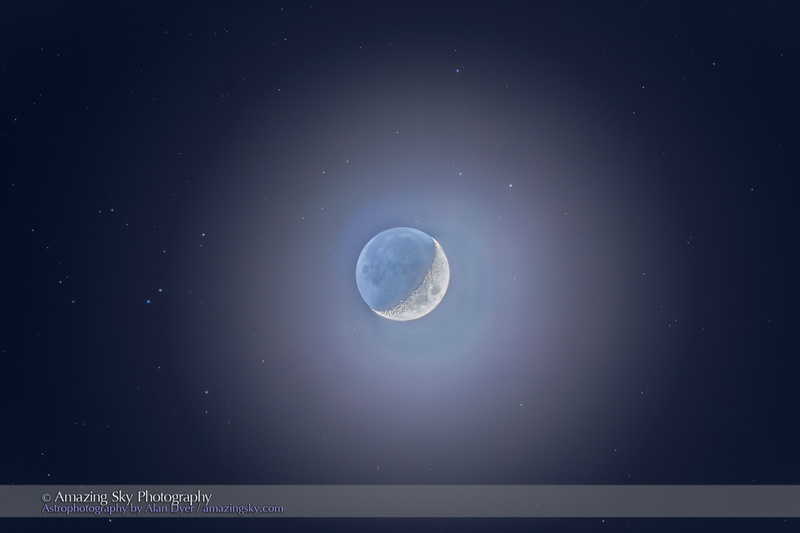 Clear skies and enjoy the Moon meet-ups in March! 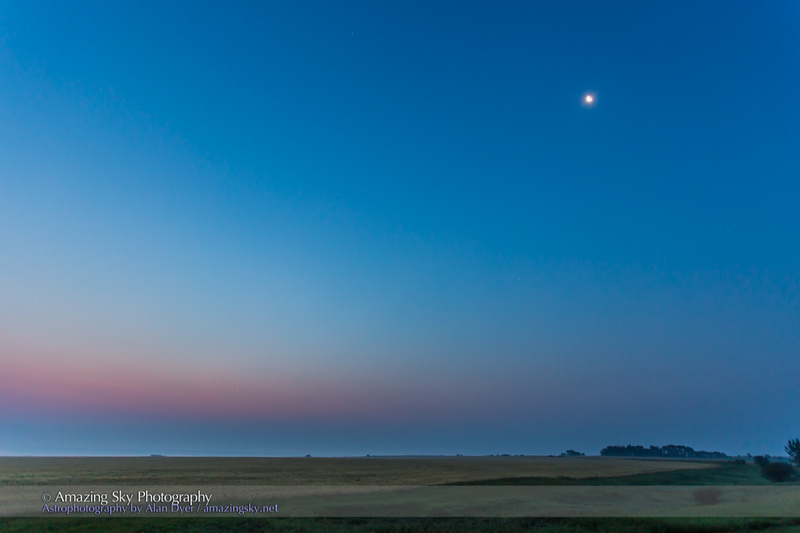 It was a fine celestial sight to begin the week, as Venus met Jupiter in the dawn sky. This morning, August 18, Venus and Jupiter appeared just 1/2 degree apart, as close as they’ve appeared to each other since 1999. The top image shows the wide-angle setting, with Venus and Jupiter tightly paired near the horizon, and the waning Moon above, itself in conjunction with Aldebaran in the Hyades star cluster. 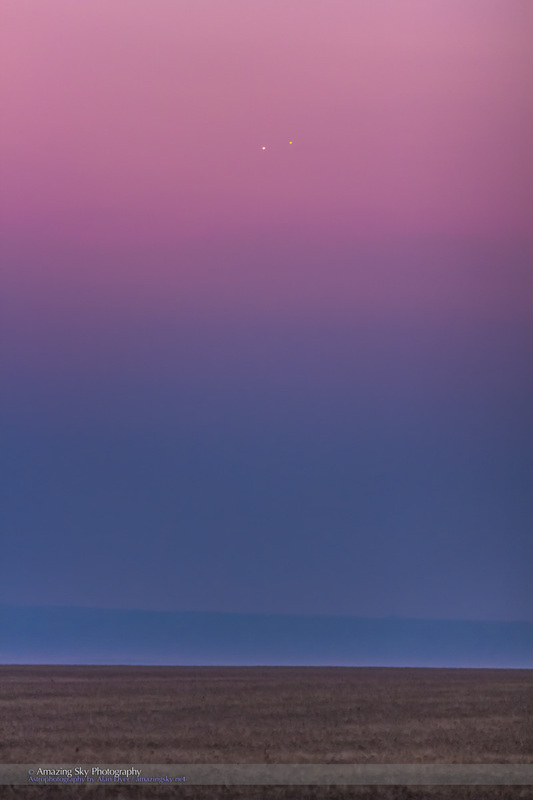 This zooms into the main event, the Venus-Jupiter pairing, as they were emerging from the horizon haze. I shot this from home, off the back deck, having little ambition at 5 a.m. to venture any further afield. I had planned to shoot this from Dinosaur Park but had second thoughts on the hour drive there and back! This zooms into the secondary show this morning, the meeting of the waning crescent Moon with the brightest star in Taurus, Aldebaran, and its companion stars in the Hyades star cluster. This is a telephoto lens shot with a fixed camera, no tracking. 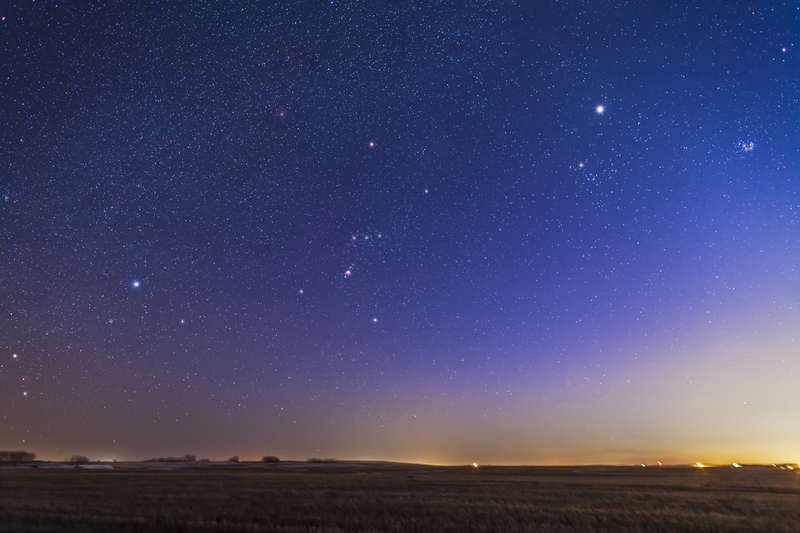 Thus begins a fine two weeks of stargazing, weather permitting, as the Moon exits the sky to leave us the summer Milky Way at its best, and dual pairs of planets in the dusk and dawn sky – Mars and Saturn converging in the evening and Venus and Jupiter, now parting ways, in the morning.